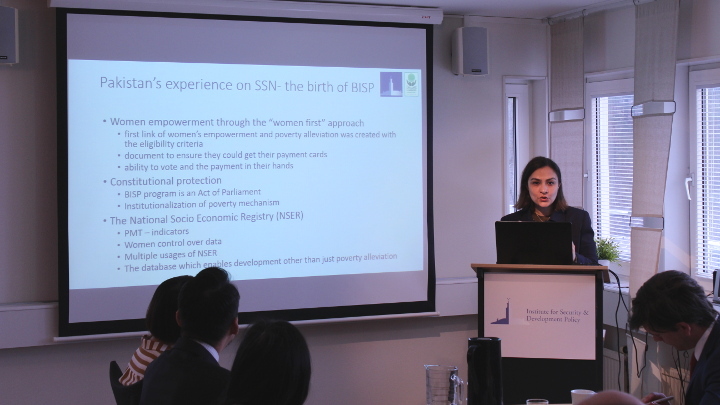 On April 10, 2019, ISDP hosted a roundtable session with Ms. Marvi Memon, former Chairperson of the Benazir Income Support Program (BISP) and federal minister (2015-2018) in the Government of Pakistan. Ms. Memon delivered a presentation on Pakistan’s experience with alleviating poverty by empowering women. The presentation was followed by a discussion with representatives from relevant government agencies and think tanks and ISDP staff. As the former Chairperson of BISP, Ms. Memon focused particularly on the efforts of that organization toward empowering women, with an emphasis of the importance of payments going directly to women in poor households. As women tend to spend their income on education, groceries and other daily necessities, BISP is implemented by focusing particularly on these women with the objective being stimulating consumption and cushioning the negative effects of slow economic growth. BISP has far-reaching cooperation with international organizations, which play play a crucial role on technical assistance, budget contribution, accountability and knowledge sharing. The discussion after Ms. Memon’s presentation focused on South-South Cooperation, local resistance to targeting women directly, and the roles of women in peacebuilding.